20 Nov 2017 Uttar Pradesh. 22 Nov 2017 Haryana, J&K and Himachal Pradesh. 23 Nov 2017 Uttarakhand, Rajasthan, Bihar, Assam, Orissa, West Bengal, Delhi. (a) Age - 17½ - 23 yrs. (born between 20 Nov 1994 and 20 May 2000 both inclusive). with minimum 50% marks in aggregate & 40% in each subject. (a) Age - Age 17½ – 21 yrs (born between 20 Nov 1996 and 20 May 2000 both inclusive). minimum 33% in each subject OR 10+2 pass (any stream). (a) Age - 17½ - 23 yrs (born between 20 Nov 1994 and 20 May 2000 both inclusive). (b) Qualification - 10th class pass (any stream) - Washerman & Support Staff (ER). 8th class pass - House Keeper. brothers of servicemen/Ex-servicemen of Bengal Sappers). graduate or has a higher qualification, percentage marks scored in class XII would take precedence. photocopy of documents, downloading document from email etc. Candidates not in possession of any of the above documents on respective day of rally will be rejected forthwith. 2. 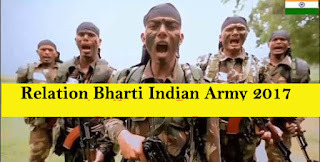 Sons of Servicemen/Ex-Servicemen/Widows/War widows and real brothers of servicemen/Ex-servicemen & sportsmen of International/National level only are eligible for seeking enrolment through sports quota (Sol GD & Sol Tech trade only). Wards & brothers of Navy, Air Force, Para Military forces are not eligible. 3. Availability of vacancies is subject to change. Ground. If found in possession of mobile phone/any other electronic device, candidate is liable to be disqualified from entry.